We’re all about firsts this fall. 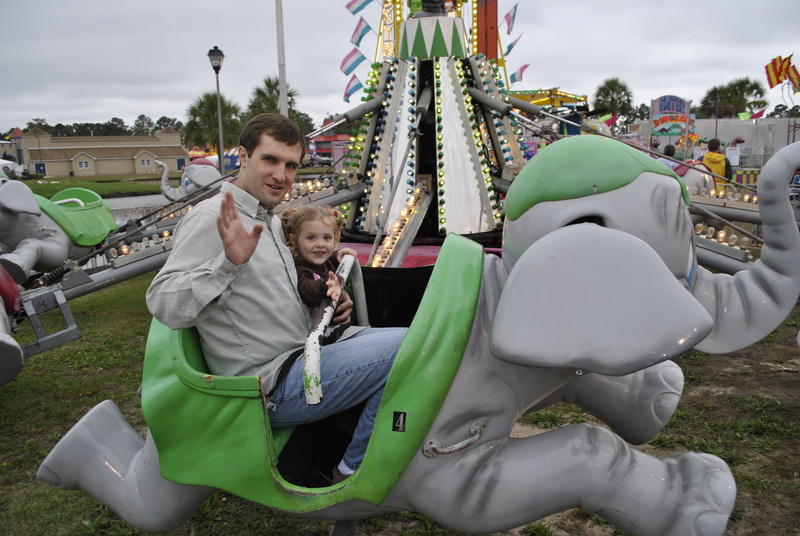 Last night, we went to the Coastal Carolina Fair. Until last night, the fair was my enemy. It makes traffic horrible. We were trying to get home after the USC game last Saturday to find the exits to our house WAY backed up. I think if we had waited in the traffic, it would have taken over an hour. But a couple of U-turns, driving in the median, getting pulled over, and a “warning” later we did make it back to another exit and took the “long way” home. But last night, it was quite convenient to live so close to the fair. Especially since we went at 3:00 when it opened and it was overcast, so there was no traffic or crowds or lines. We paid the $16 to get us in the gate, but I’m not sure what that fee is for considering EVERYTHING else you do costs money – the rides, the food, the games. We tried to entertain Piglet with the 4H animal tent, which was “free”. She usually loves animals and petting zoos, but yesterday, she was terrified of the animals. She did look briefly at the giant pig who was nursing her 8 piglets, laughed, and said, “those pigs are tickling their mommy’s belly.” (as a currently nursing mother, that sight was terrifying for me). But when we tried to look at the cows or horses, she cried real tears, yelling, “I want to leave this place”. Oh well. So we walked around for a while. 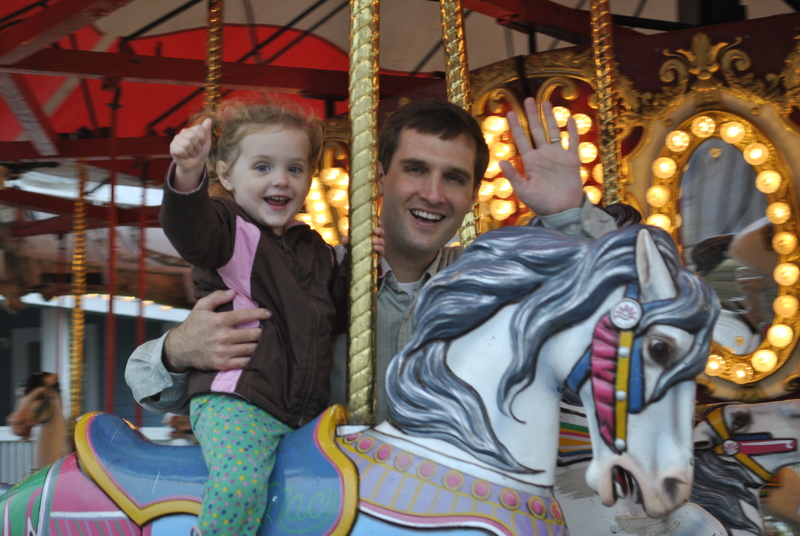 80% of the people we passed commented on how cute Baby B was in the baby bjorn or how clever it was or how “that’s the way to get around” like they had never seen such an invention – of course, it WAS the fair where they focus on inventions like fried butter and fried Twinkies. seriously. After wandering and taking in all of the fried options and odd sights, we finally bit the bullet and bought some tickets for the rides. Piglet was a HUGE fan of the rides. She would have ridden for hours if we had an endless supply of money. 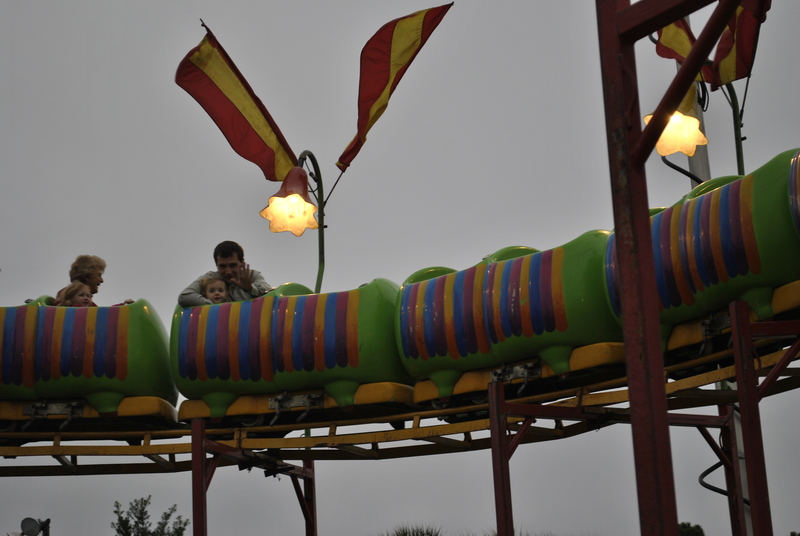 But alas, she had to settle for three rides (fortunately, Russ got to ride with her fo’ free). 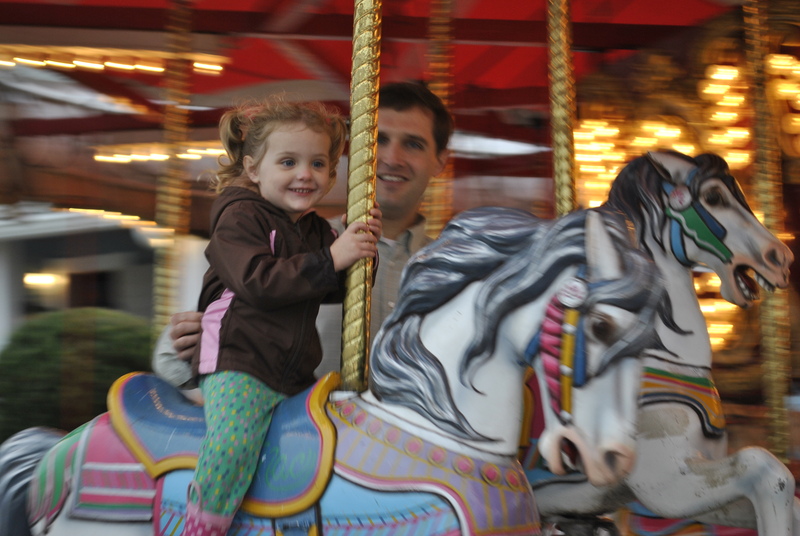 She started out small with the carousel. Then she went a little bigger with the flying elephants. And THEN she went on a roller coaster, which she thought was awesome. She kept saying that she wanted to go on more rides, but we distracted her with dinner and a funnel cake. I don’t know which she liked better the funnel cake or the rides, but I know she was a big fan of the fair. She says she wants to go back today. $16?! Did they charge for Taylor and Caleb? I’ve never been a real big fan of the fair.